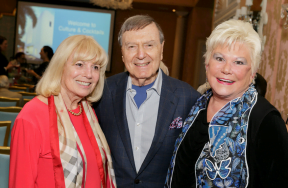 (Lake Worth, FL – March 8, 2018) The Cultural Council of Palm Beach County today announced that 120 friends and fans attended this season’s second CULTURE & COCKTAILS last Monday at The Colony Hotel in Palm Beach. The evening’s topic was SHINING BRIGHT: The Eternal Allure of Silver, A Conversation with Michael James, Owner & Founder of The Silver Fund, the largest dealer worldwide in estate Georg Jensen silver, having sold more than $40-million since 1996 to private clients around the world. James, who displayed more than a half million dollars of dazzling silver pieces that night, has helped to build multiple large collections and exhibits at exclusive art and antique fairs in the US including New York, Los Angeles, Palm Beach, Dallas, Chicago and San Francisco, as well as in London, Germany, Switzerland, France and Italy. He was interviewed by Daphne Nikolopoulos, Author & Editor-in-Chief of Palm Beach Illustrated. CULTURE & COCKTAILS will end the season with our traditional musical finale, featuring both conversations with cultural leaders and stirring performances – both live and filmed – by some extraordinary singers. CULTURE & COCKTAILS is generously sponsored by The Roe Green Foundation, Roe Green, Founder and The Milton and Tamar Maltz Family Foundation. Additional support for the series is provided by the Palm Beach Daily News, First Republic Bank, and PR-BS, a Boca-based ywuwuz public relations firm. Admission to each CULTURE & COCKTAILS event is $65 for advance RSVPs, $85 at the door, and FREE for members of the Cultural Council ($250 level and above). Seating is limited. All proceeds go to support artist programs of the nonprofit Cultural Council of Palm Beach County. For membership information, please contact Debbie Calabria at (561) 472-3330. Each event runs from 5 to 7 pm, with registration and cocktails from 5 to 5:45 pm, and the “Conversation” from 5:45 to 7 pm, including audience Q&A. The Colony will serve complimentary beverages and an array of specially prepared hors d’oeuvres before each CULTURE & COCKTAILS conversation. People interested in attending CULTURE & COCKTAILS can RSVP before each event by calling the Cultural Council at (561) 472-3330. Topics and speakers are subject to change depending upon the availability of scheduled participants. The Cultural Council is the official support agency for arts and culture in The Palm Beaches, serving non-profit organizations, individual artists and arts districts. The Cultural Council administers $4.5 million in grants annually, supports arts and cultural education, provides capacity-building training and advocates for arts funding and arts-friendly policies in Palm Beach County, Florida’s Cultural Capital®. The Council promotes Palm Beach County’s cultural experiences to visitors and residents through multi-platform marketing and public information programs, including its one-of-a-kind Cultural Concierge service. The Cultural Council presents exhibitions featuring Palm Beach County artists and provides additional programming at its headquarters in the historic Robert M. Montgomery, Jr. Building, an iconic Streamline Moderne former movie theater in Downtown Lake Worth. Also at the Cultural Council headquarters are the Roe Green Uniquely Palm Beach Store featuring products by Palm Beach County artists and the Jean S. and Frederic A. Sharf Visitor Information Center, a VISIT FLORIDA designated Florida Certified Tourism Information Center. The Cultural Council galleries, visitor information center and store are open 10 a.m. to 5 p.m., Tuesday through Saturday. For a complete calendar of cultural activities in The Palm Beaches, connect with the Council at palmbeachculture.com or (561) 471-2901. To plan a personalized cultural itinerary, connect with the Cultural Concierge at palmbeachculture.com/concierge. To learn about the benefits of individual, business, artist or musician membership to the Council, please contact dcalabria@palmbeachculture.com.